I’m in europe this week, using euros for everything instead of dollars. So I thought it would be an appropriate time to talk about currency risk in a business. When you have a business that only generates revenues in your local currency, you don’t have to concern yourself with the fluctuations of one currency versus another. But if you start generating revenues in other currencies, or if you open an office outside of your country and start generating expenses in other currencies, you will have to start thinking about currency risk. So let’s say that 20% of your company’s revenues are euro denominated. And let’s say that your business is doing $10mm a year in revenues. So about $2mm in US dollars of your revenue is in euros. And let’s say that was the case at the beginning of the year. At that time, the exchange rate was about .7 euros to 1 dollar. So your business was generating 1.4mm euros in revenues. Since the start of the year, the euro has dropped and now you get .8 euros for every dollar. So if your business is still generating 1.4mm euros in revenues, that is now only $1.75mm dollars of revenue per year. You are still selling just as much in euros, but your annual revenues in dollars has dropped $250,000 in six months. 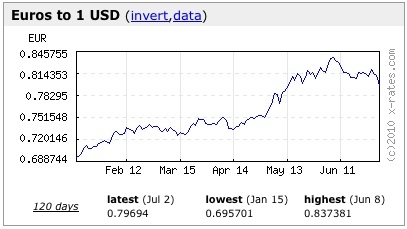 That is how currency fluctuations can impact a business. Let’s do the same analysis, but this time with expenses. If at the start of the year, you had $2mm in annual expenses in a euros because you have an office in europe with employees, rent, etc, then you had 1.4mm euros in annual expenses. By June of this year, those expenses have dropped to $1.75mm, saving your company $250,000 in annual expenses. What this example shows is the primary lesson of currency risk in business. It is ideal to have your foreign currency denominated expenses and revenues be as close to each other as possible. Because if you can do that, they are a natural hedge. If our examples are combined, and you have $2mm of revenues and $2mm of expenses in euros (a breakeven business in euros), then your profits will not be impacted by currency fluctuations. Your revenues might go up or down, but your profits will be immune. If you cannot match foreign currency denominated revenues and expenses, then you will have risk to your business. If the foreign currency revenues and/or expenses are small (measured in the millions or less), then you should not do anything about this risk. Just understand that you have the risk and live with it. But if your unmatched foreign currency denominated revenues and/or expenses are in the tens of millions of dollars or more, then you can hedge the risk. As I explained in last week’s post, there are a number of hedging strategies that you can put in place to manage this risk. There are currency desks at the major money center banks and global brokerage firms that specialize in hedging currency risk for companies and they will be happy to put in place currency hedges for you. Hedging currency risk can get expensive, which is why I don’t recommend it for small companies, but for large companies with significant currency risk, it is standard business practice and it is very common. For many entrepreneurs, currency risks are not going to be something to worry at the start of the business. But we see most of our portfolio companies start thinking about international expansion about five years into the development of their business. They open an office outside the US and start generating non dollar denominated expenses. In time, they start generating non dollar denominated revenues. At some point, these amounts become significant and the CFO has to start thinking about currency risk. If you get to that point in your business, think of it as a good sign. Something to manage for sure, but a sign that the business is on the right trajectory. Fred, well said, especially about the natural hedge of expenses & revenues within the same currency. 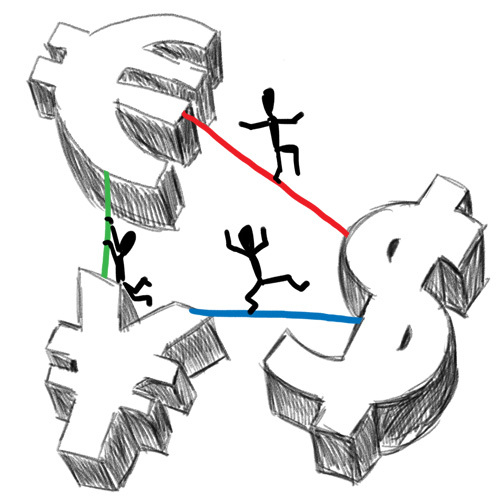 One more thing – currency fluctuation can affect startups while raising VC money too. Entrepreneurs who are raising money from an offshore VC should remember this and talk terms in local currency. We did and it made a significant difference. Even a 1% variation in currency value (between the time the terms are tentatively agreed upon, to the time the money comes to the bank) can be significant for a startup. This article was originally written by Fred Wilson on July 5, 2010 here.